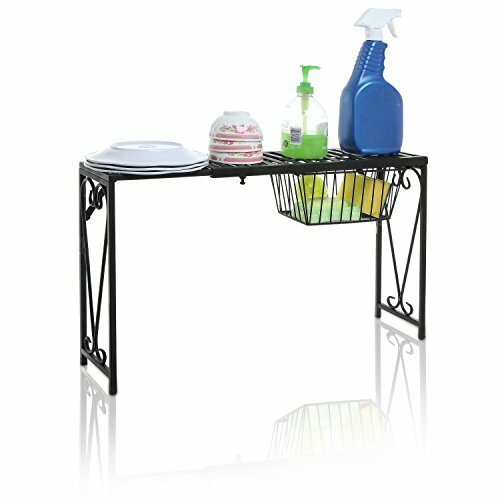 Keep your kitchen sink area clutter-free with this freestanding metal organizer rack. Perfectly sized to fit on your kitchen counter, this versatile metal shelf can also be adjusted as needed to fit the length of your sink. Free up valuable counter space by using the sturdy metal shelf surface at the top to store lotions, dish soap and sponges. The counter stand can also be used in the pantry for storing and stacking canned and boxed foods as well as other items as needed, and take advantage of the wire mesh hanging basket below to keep small or loose items securely stowed. For a stylish way to add extra storage space and organization to your kitchen, make this metal shelf rack yours today. Approximate Dimensions (in inches): Overall (fully extended) - 35.5 W X 13.75 H X 6 D; Small Drawer - 8.75 W X 4 H X 6 D.
A freestanding kitchen rack made of metal and featuring a black finish and an elegant scrollwork design. The length of this rack can be adjusted as needed to best fit your space on the counter, pantry or over-the-sink. The hanging pull-out drawer is made of wire mesh with a metal frame and can be used to store a variety of items, including sponges or scrubbers.